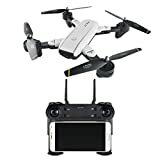 · Innovative drone for autophotos, HD 720p 2.0 Mpx, the wide-angle camera allows you to get great portraits effortlessly. · The optical positioning of the photo is post-switching on of dual HD camera (only for the optical flow version). · 3D openings with incredible agility provide a 6-axis aerial spectacle, turn calibration function.